The Sea Hunter autonomous unmanned vessel was christened in April 2016. Image: courtesy of Defense Advanced Research Projects Agency. The Sea Hunter has a maximum speed of 27kt. Image: courtesy of Defense Advanced Research Projects Agency. The ACTUV project is developed by DARPA for the US Navy. Image: courtesy of Defense Advanced Research Projects Agency. Sea Hunter is an anti-submarine warfare (ASW) continuous trail unmanned vessel (ACTUV). It was christened at Caruthers Landing in Oregon in April 2016. The technology demonstrator is designed, developed and built by the Defense Advanced Research Projects Agency (DARPA) for the US Navy. The autonomous unmanned vessel is intended primarily to track enemy diesel-electric submarines in shallow waters. It can also be used for intelligence, surveillance and reconnaissance (ISR) tasks, unmanned underwater vehicle (UUV) / UAV launch and recovery, and transportation of vehicles and running logistics of the US Navy. The ACTUV programme was launched in 2010. In November 2012, DARPA selected Leidos, a joint spin-off of Science Applications International Corporation (SAIC), as the prime contractor to design, construct and test the ACTUV prototype through four phases, under a $59m contract. Leidos provided conceptual design services in the first phase and a final design and production plan in phase two. The third phase included construction of the experimental vessel, while testing by the government will be performed in the fourth phase. Construction on the ACTUV began in 2014 and a memorandum of agreement (MoA) was signed by the Office of Naval Research (ONR) and DARPA to jointly fund an extended test phase of an ACTUV prototype in September 2014. The sensor and behaviour systems will be tested on surrogate vessels and then installed in the Sea Hunter. The ACTUV prototype maritime autonomy system, which was integrated onto a 42ft surrogate boat, made its first autonomous voyage between Gulfport and Pascagoula, Mississippi in January 2015. The vessel was finally launched in January 2016. DARPA and ONR will conduct open-water testing of the technology demonstration vessel off the California coast in mid-2016, to evaluate the capabilities of the vessel and its payloads. The DARPA-sponsored programme is expected to be transitioned to the US Navy by 2018. The 40m-long Sea Hunter unmanned surface vessel features long, narrow body, supported by twin-screw trimaran design with a main hull and two smaller outrigger hulls, and weighs 140t. The hull offers enhanced stability and lift to the vessel. The vessel can operate autonomously using a sparse remote supervisory control model or can also serve as a remotely-piloted vessel as required. Inbuilt advanced software and hardware systems allow the ocean-going vessel to operate safely near manned maritime vessels. The Sea Hunter ACTUV’s modular design allows for integration of flexible mission payloads suitable for a range of tasks. The high-resolution stereo and 360° electro-optic/infrared (EO/IR) sensor systems ensure safe navigation and situational awareness during day/night lighting conditions. Long-range mid-frequency active-passive sonar aboard the vessel detects and classifies the targets. The vessel also carries long- and short-range radars, and a variety of sensors and mission packages for ISR missions. The Sea Hunter technology demonstrator is powered by two diesel engines, each driving a propeller. It has a maximum speed of 27k and can operate up to a range of 10,000nm when sailing at a speed of 12k in open seas. It can stay afloat for 60 to 90 days. The vessel is capable of operating under all weather and traffic conditions, both during day and at night. It can sustain Sea State 5 at wind speeds of 21k and wave heights of approximately 6ft. It can also withstand Sea State 7 with wave heights of 20ft. "It has a maximum speed of 27k and can operate up to a range of 10,000nm when sailing at a speed of 12k in open seas." 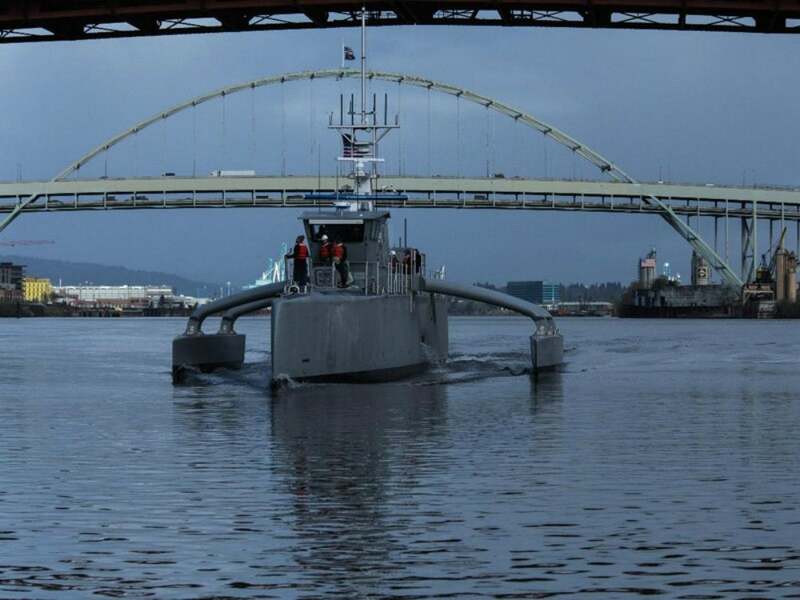 Yacht builder Christensen Shipyards was contracted to build the ACTUV prototype under the supervision of Oregon Iron Works. The vessel was later moved to the latter’s owner Vigor Industrial at the Portland shipyard. Carnegie Mellon University (CMU), in partnership with the National Robotics Engineering Center (NREC), will develop autonomy system for the ACTUV. The National Aeronautics and Space Administration’s (NASA) Jet Propulsion Lab will support autonomy capabilities of the vessel.